Come On. You KNEW there would be a cat post eventually. We had a deal. Me and this cat. I was to adopt him and he was to be a cat. I bought him the usual swag- a litter box, over-priced food, treats, mouse toys, a plush bed, catnip and a scratching post. He was perfect in the car, not a meow or cry at all. He just sat in his carrier, happy to be away from those other annoying cats. I plopped him on the floor of my place and he walked out and immediately owned it. No fear, no regret, he was home. His name is Harrison and he also thinks he is a dog. He runs to the door to greet people. 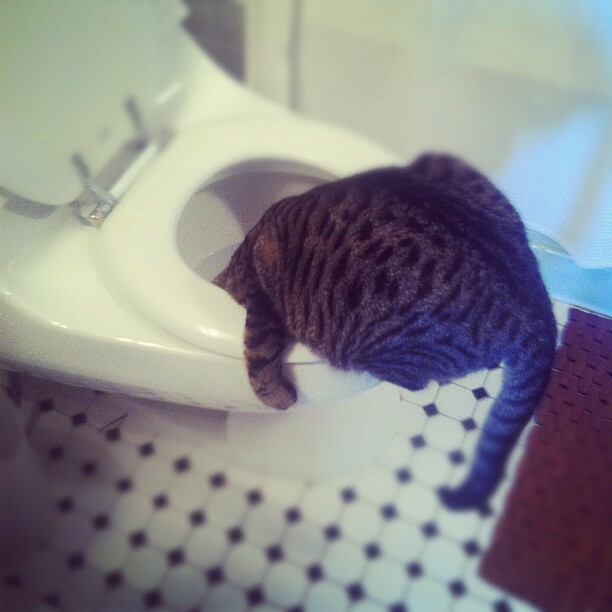 He drinks out of the toilet. When you play with him, he prefers to be chased and then he chases back. He refuses to use any of the scratching posts I bought him (hence, two ruined chairs already), does not give catnip a second sniff and will not sleep in that damn forty dollar bed I bought. I caught him sleeping in it once and I made such a fuss over it, he rolled his eyes at me and immediately got out of the bed and has yet to return (total cat move). This is what I love about him. He has chosen to not be a cat by being just that, a cat. Harrison is not going to let anyone tell him how to be. He sleeps in the bathtub and carries the bar of soap around the house in his mouth. He curls up in the back seat of my car for road trips. And, he knows how to open the kitchen cupboard door to drag out his dry cat food. A real cat enigma. I am honoring Mr. Harrison today for being himself, and for not giving in to what I think he should be playing with or where he sleeps. I went in for a cat, and got a peculiar and surprisingly hot mess of a feline that fits me perfectly. What a deal. New Year’s Resolutions? I don’t think so. Standing and Waiting: How New Yorkers Pass the Time. Life ain’t easy in the big city. Oh. wait. It is! Update to: NYC: Medicine Cabinets & Condiments, Where have you gone? NYC: Medicine Cabinets & Condiments, Where have you gone? It’s Official! Or is it? We’re not in Kansas (or Queens) Anymore. It’s Easter. Let’s Talk About Eggs. Absence makes the waist smaller. The clock is ticking. And it’s not a biological one. Absence is making my head…Clearer? Huh. Absence makes the liver grow…Sadder? I know you do! He loves you too 🙂 he needs some more auntie Selena time. I love watching his exploits as posted on FB. Keep ’em coming. Looking for a post? Search here. Opinions, uncensored thoughts, complete randomness.